I'm happy to report that we are one step closer to getting the story of Josef Jakobs published! 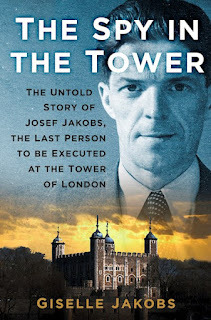 The History Press has added "The Spy in the Tower: the Untold Story of Josef Jakobs, the Last Person to be Executed at the Tower of London" to their roster of books, available on their website. The cover is provisional but I have to admit, it is very similar to the image in my head that has been accompanying me on this journey. Pre-orders are quite a big deal for a book, and if any of you readers are in the UK... and plan to purchase the book... then a pre-order counts for quite a lot in the publishing world. For those of you readers outside of the UK (e.g. Canada or the US), I think patience is required. Apparently UK publication dates are months ahead of International publication dates. But... more details as I have them. I had been running with a UK publication date of May 19, 2019 but... I also see that the publication date is now May 1, 2019, although that too may alter depending on the editorial process.